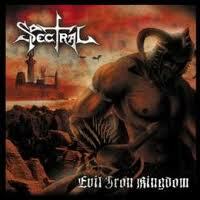 SPECTRAL were formed in 1995 by both German „Teutonenlord“ Wollwert-vocals/guitars, and Meik „Destructor“ Meiers on the drums. After the first few tries coupled with the usual line-up changes in 1999 they finally released their first 4-track demo “Teutonic Symphony”. In 2001 the first fulltime and self financed CD „Barbaric Assault“, recorded at the Siegburger Gernhart Studios, was released. From hence was this the debut of the term BLACK VIKING POWER METAL. This received a great response in the Metal Press (10 of 12 points from the “Heavy, oder was? !” magazine). As a result of this they were booked quite often for live gigs. The line-up: Zerberus (voc. ), Teutonlord (guit. ), Nidhögg (guit. ), Agressor (bass) and Destructor (dr.) found themselves in 2004 again in front of the gates of the Gernhart Studio, located in Siegburg. It was there that they recorded the next CD „Dawn Of The Gods“, which became the most well received and mature work of the band to date. The press were excited and so again they received 11 from 12 points from “Heavy, oder was?!”. Even Götz Kühnemund from „Rock Hard“ declared SPECTRAL to the upper echelons of the German underground. In the following summer Zerebus unfortunately left the band, however to nobody´s suprise. An equal replacement was soon found in the form of screamer Marco “Vidar” Ewertz, who proved his front-qualities in the first concerts at the end of 2005/beginning of 2006. Aggressor, bassist of the band, left the camp on a friendly basis in the summer of 2006 and was replaced by Florian „Excrementor“ Thome. It was in this constellation that the new album was recorded in the beginning of 2007 at, again, the Gernhart Studio in Siegburg. 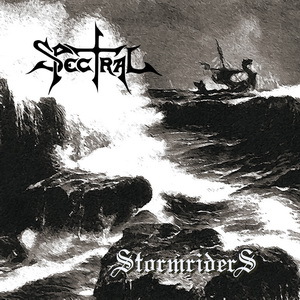 “Stormriders”, the title of the third and complete SPECTRAL CD, is without question the their masterpiece. Aggressive song structures coupled with atmospheric hymns provide for a style which is unique in Germany. Their influences, which are evident in the music, are BATHORY and AMON AMARTH as well as DESTROYER 666, the early RUNNING WILD and MANOWAR!! Six stringer Nidhögg left the band shortly after the recordings but was replaced by our ex-member Aggressor, who prefers playing the guitar and is now a full member of SPECTRAL.